SUMMARY: Vertebral compression fractures are very common, especially in the elderly. Benign osteoporotic and malignant vertebral compression fractures have extremely different management and prognostic implications. Although there is an overlap in appearances, characteristic imaging features can aid in the distinction between these 2 types of compression fractures. 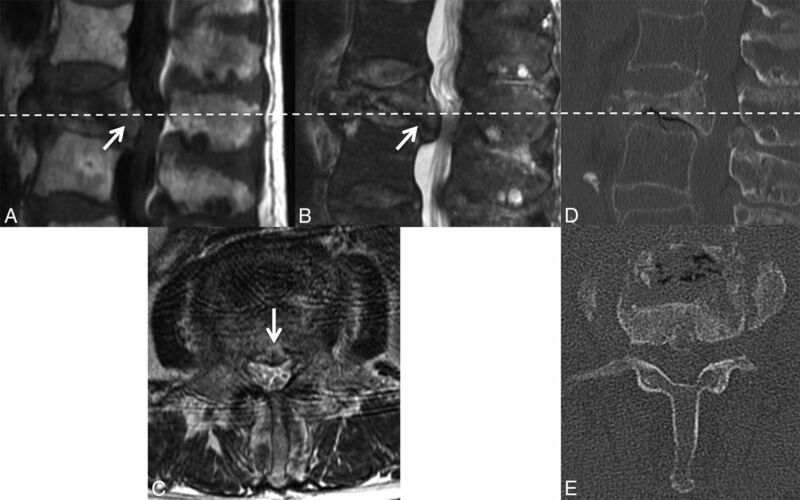 The aim of this review is to characterize the imaging features of benign and malignant vertebral compression fractures seen with CT, PET, SPECT, and MR imaging. Vertebral compression fractures (VCFs) can have a variety of etiologies, including trauma, osteoporosis, or neoplastic infiltration. Osteoporotic VCFs have a prevalence of approximately 25% among all postmenopausal women and occur less frequently in similarly aged men.1 Trauma is the most common etiology in those younger than 50 years of age. However, many cancers, such as breast, prostate, thyroid, and lung, have a propensity to metastasize to bone, which can lead to malignant VCFs.2 Indeed, the spine is a site of metastasis in 10%–15% of cancers.3 In addition, primary tumors of bone and lymphoproliferative diseases such as lymphoma and multiple myeloma can be the cause of malignant VCFs. Differentiating benign and malignant VCFs can present a diagnostic dilemma, particularly in the elderly, with considerable management and prognostic implications. Advanced imaging is often used to attempt to distinguish benign from malignant VCFs. The aim of this review is to describe and illustrate the imaging features of benign and malignant VCFs. The imaging modalities used in the clinical setting for this diagnostic purpose include CT, PET, SPECT, and MR imaging. MR imaging traditionally has been the technique of choice because characteristic morphologic features, enhancement patterns, and signal intensities are well-described in the literature. Relatively recently, chemical shift, dynamic contrast-enhanced imaging, and diffusion-weighted MR imaging have also been more thoroughly investigated. The multimodality imaging features and common pitfalls will be discussed. In the subsequent sections, technique and sign-related pitfalls will be discussed. In general, most pitfalls can be attributed to a few common issues: The first is that acute (<2 weeks) and subacute (2 weeks to 3 months) benign VCFs often have large areas of MR signal alteration or increased metabolism on nuclear medicine modalities that can mimic malignancy, owing to intertrabecular hemorrhage, edema, and the early reparative process.4,5 Chronic (>3 months) benign VCFs have small areas of usually linear signal alteration and restoration of fatty marrow and normal metabolism, which make these easier to identify.4 Unfortunately, precise timing of the fracture can often be difficult to elicit from the patient or medical records. Multiple myeloma, a common cause of VCFs, is also an important pitfall. Myelomatous lesions can be present within vertebral bodies with normal bone marrow signal.6 Multiple myeloma infiltrates bone marrow either diffusely or in a nodular pattern. When it is diffusely distributed in the bone marrow, it may give the appearance of osteoporosis, potentially from diffuse osteoclast activation.6,7 VCFs from multiple myeloma can appear benign in 38% of cases.7 Acute-subacute symptomatic myeloma-related VCFs may not demonstrate edema, either.8 Inadvertent inclusion or exclusion of this patient population in studies may account for the sometimes discordant findings in the literature. A summary of the key imaging features that can be helpful in differentiating benign and malignant fractures is found in the Table. Abnormal pedicle marrow signal in a malignant VCF. A, Sagittal T1WI of the lumbar spine demonstrates a malignant VCF of L3 with loss of the high T1 normal marrow signal within the pedicle (arrow), indicating tumor infiltration. B, Sagittal T1WI of the lumbar spine demonstrates a typical benign VCF of L1 anteriorly, with preservation of the normal high T1 marrow signal within the pedicle (arrow). 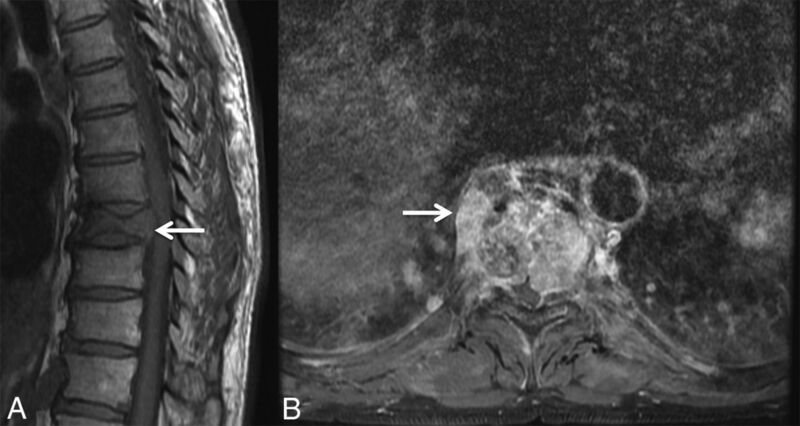 Moreover, malignant VCFs may have preserved marrow signal within 1 or both pedicles (for example, preserved signal on the right in Fig 2) because the presence of abnormal signal is dependent on tumor infiltration. Fracture lines without cortical destruction in a benign VCF. 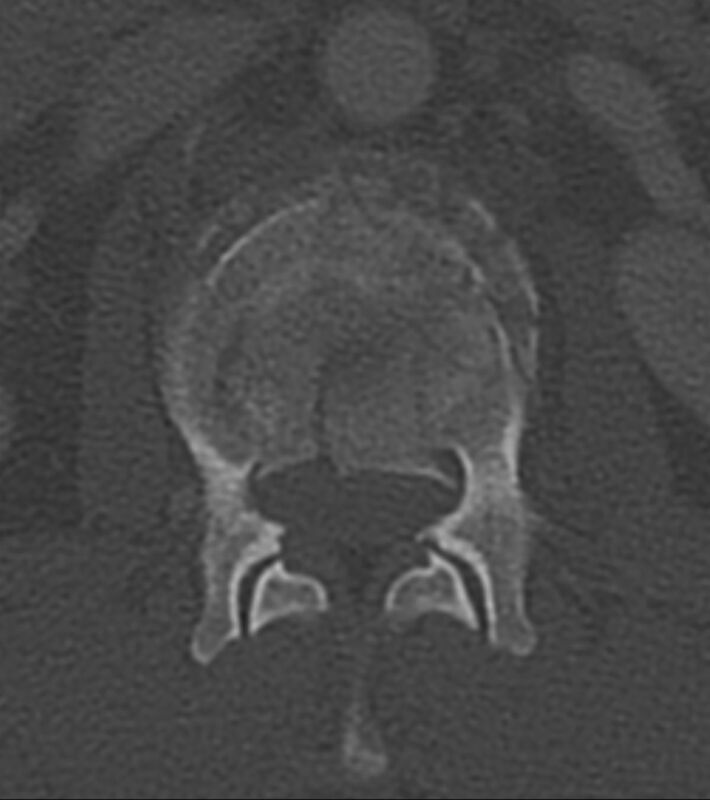 Axial CT with bone windows shows the linear and well-delineated borders of the slightly displaced bone fragments within this benign VCF, an example of the puzzle sign. Masslike extension into the paravertebral and epidural space in a malignant VCF. A, Sagittal T1WI of the thoracic spine demonstrates a malignant VCF of T9 with loss of the high T1 normal marrow signal within the vertebral body and convex bowing of the posterior cortex (arrow), both signs indicating a malignant fracture. B, Axial postcontrast T1WI with fat saturation of the T9 fracture demonstrates an irregular enhancing mass (arrow) extending into the right paraspinal soft tissues and the epidural space in this malignant VCF. Diffuse abnormal marrow signal in a malignant VCF. Sagittal T1WI of the lumbar spine demonstrates a malignant VCF of L2 with marked complete replacement of the normal high T1 vertebral body marrow signal. The diffuse T1 hypointensity indicates tumor infiltration. Note the convex, expanded border of the posterior vertebral body versus the normal posterior concavity of the adjacent vertebral bodies. Increased enhancement in malignant VCF. 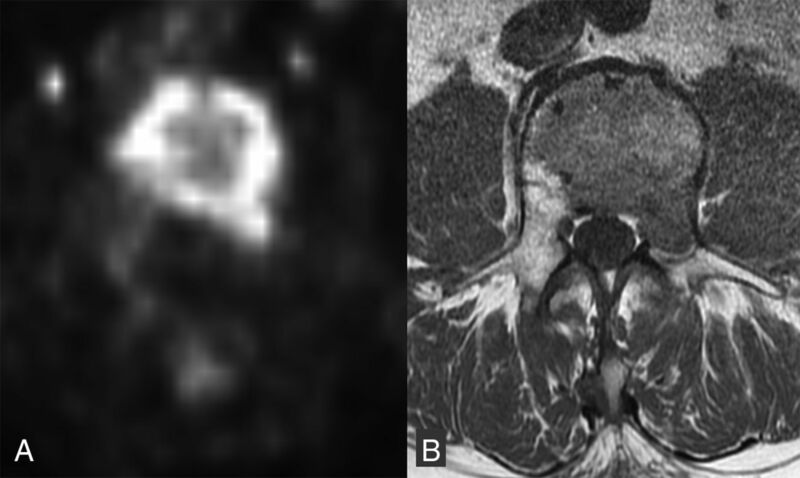 Sagittal T1WI postgadolinium with fat saturation of the lumbar spine demonstrates an enhancing malignant VCF of L2. The enhancement is greater than that of the normal adjacent vertebral bodies. Also demonstrated is an expanded posterior convex border. Retropulsion of a bone fragment in a benign VCF. 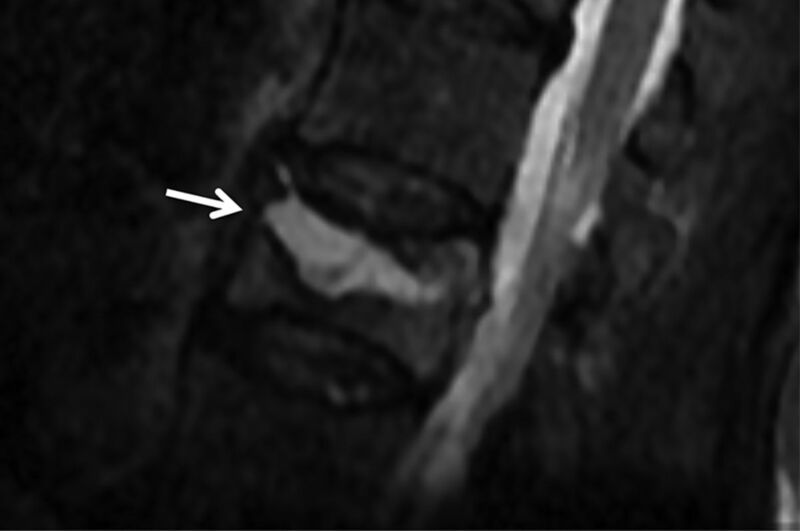 Sagittal T1WI (A) and T2WI (B) with fat saturation of the lumbar spine demonstrate a retropulsed bone fragment (arrow) compressing the thecal sac and narrowing the spinal canal in this benign VCF (C), best seen on the axial T2WI. A similar appearance is demonstrated on the axial (D) and sagittal (E) reformatted thoracic spine CT scans. 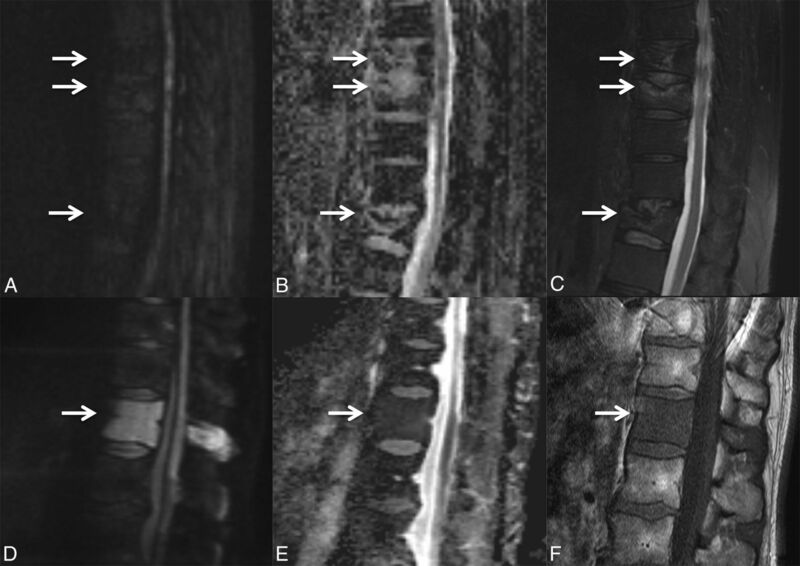 Multiple VCFs throughout the spine typically favor a benign osteoporotic etiology. However, the possibility of underlying multiple myeloma should be considered in these patients14; multifocal metastases with multilevel pathologic fractures are less likely to cause this appearance. The presence of other healed benign VCFs or compression deformities without bone marrow edema suggests benignity of a new fracture.18,19 Likewise, known spinal metastasis within other segments or indeterminate vertebral lesions suggest malignancy as the cause of new fractures.9,14,18 A potential pitfall would be that it is possible to have both malignant and benign VCFs in the same patient. Signal Intensity and Enhancement Patterns. Linear horizontal fracture line in a benign VCF. As seen on the sagittal reformat from a thoracic spine CT in bone windows (A), there is a lucent fracture line (arrow) paralleling the superior endplate of T11. 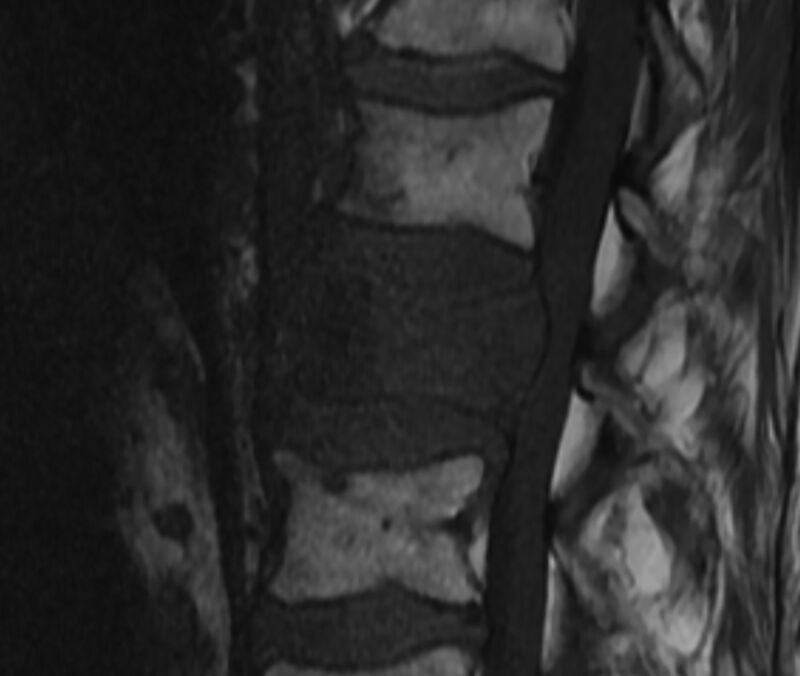 On MR imaging, this fracture is seen as a linear horizontal line (arrow) of T1 and T2 hypointensity through the T11 vertebral body, T1WI (B) and T2WI (C). Fluid cleft in a benign VCF. Sagittal T2WI with fat saturation of the lumbar spine demonstrates a triangular fluid cleft (arrow) seen within this benign VCF. DWI of benign and malignant VCFs. 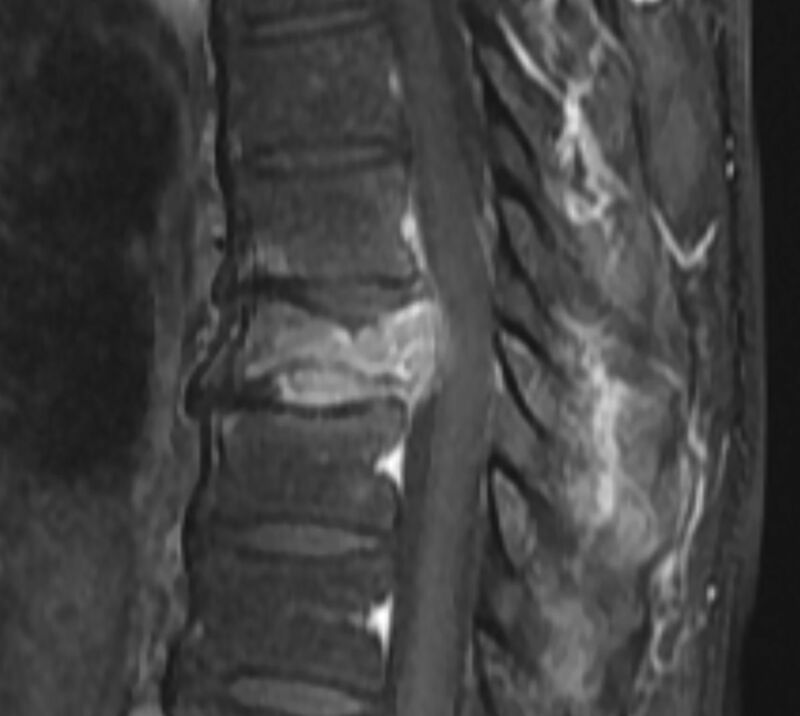 Multiple benign osteoporotic VCFs (A–C, arrows) are seen in the lower thoracic spine. Sagittal DWI (A) and the corresponding ADC map (B) demonstrate the absence of diffusion restriction. Sagittal fat-saturated T2WI (C) demonstrates T2 hyperintensity about the fracture lines compatible with edema from an acute/subacute fracture. In contrast, malignant lymphomatous involvement of T12 (D–F, arrow) demonstrates diffuse diffusion restriction (D) with corresponding low ADC values (E). On the sagittal T1WI (F), there is slight loss of height of the superior and inferior endplates and diffuse T1 hypointensity compatible with marrow replacement. DWI can also be quantitatively assessed. An ROI is selected within the vertebrae, and an ADC value is calculated. The ADC value is a measure of water molecule displacement per unit of time, with units of square millimeters/second.30 Multiple MR imaging sequences have been explored to maximize the distinction between the signal intensity and ADC values of benign and malignant VCFs, including steady-state precession, spin-echo, fast spin-echo, echo-planar imaging, and single-shot fast spin-echo diffusion-weighted techniques, as well as optimization of b-values.18,27,30,32⇓⇓⇓⇓⇓⇓⇓⇓⇓⇓⇓⇓–45 The results have been mixed because some of these studies can separate benign and malignant VCFs similar to conventional MR imaging, while others fail to find similar conclusions. Thus, it is unclear whether DWI provides an advantage over conventional MR imaging.27 One possible reason for conflicting results is the presence of intravertebral hematoma. One study evaluated patients with low-impact trauma, high-impact trauma, and known metastatic VCFs. Those with high-impact trauma were found to have intermediate ADC values, similar to metastatic disease.46 DWI may provide beneficial information in combination with conventional imaging; recently, Sung et al42 have shown improved sensitivity, specificity, and accuracy when the 2 were used in conjunction. CT is a readily accessible technique that can be used to evaluate patients with back pain and suspected VCFs. Laredo et al54 were the earliest group to evaluate the diagnostic value of CT. They reported several CT features that were more frequently found in benign VCFs, with the following findings achieving statistical significance: fracture of the anterolateral or posterior cortex of the vertebral body, a retropulsed bone, fracture lines within cancellous bone, and a diffuse thin paraspinal soft-tissue thickening. The “puzzle sign” is a descriptive term of the presence of sharp fracture lines without cortical destruction so that the displaced bone fragments could be reconstructed into their original position to complete the “puzzle” (Fig 2). In addition, although uncommon and not reaching statistical significance, an intravertebral vacuum phenomenon (air-filled cleft) was never visualized in malignant fractures. The use of various scoring systems and prediction models can be a helpful strategy for delineating benign from malignant VCFs.10,19,56 Yuzawa et al10 found that the combination of CT characteristics and MR imaging features enhanced the accuracy of differentiating benign from malignant fractures. The CT findings used in this scoring system included sharp fracture lines without osteolytic destruction in benign VCFs and osteolytic destruction in malignant VCFs. While MR imaging is typically superior in the depiction of most spine pathology, such studies exemplify the utility of CT in providing excellent characterization of cortical and cancellous bone and fracture margins. Generally, fractures due to tumors are expected to accumulate FDG, while benign fractures are not expected to accumulate FDG to a similarly high degree. The maximum standard uptake value (SUV) on PET of malignant pathologic fractures of various bones (pelvis, long bones, spine, and rib) is significantly higher compared with benign fractures.58 When evaluating vertebrae specifically, the SUV is significantly higher in malignant than in benign compression fractures (Fig 10).57,59 Most of these studies used a threshold SUV to classify the lesions, while some incorporated comparison with liver SUV. The cutoff SUVs ranged from 3 to 4.7. Alternative criteria included 2 SDs above (malignant) or below (benign) the liver SUV or direct comparison with the SUV of the liver in indeterminate (SUV 2–3) lesions. FDG avid malignant VCF. Axial non-attenuation-corrected PET (A) at the level of the malignant lumbar VCF with increased FDG activity throughout the vertebral body and into the left pedicle. Corresponding axial T1WI (B) shows the area of low T1 signal tumor infiltration throughout the vertebral body and left pedicle. However, there are limitations to FDG-PET. Case reports have shown benign fractures with much higher-than-expected SUVs, even up to 9.3 in an acute pelvic fracture.61 As such cases demonstrate, acute fractures can be a source of false-positive findings. FDG uptake was noted to be most intense in the acute phase of a benign fracture and returned to normal by approximately 3 months.5,62 Failure of a fracture to return to a normal FDG uptake by 3 months may indicate malignancy or osteomyelitis.5 An additional limitation is that patients receiving bone marrow–stimulating agents may have falsely elevated maximum SUVs related to increased bone marrow metabolism, so this factor should be considered in the interpretation of FDG uptake.57 In summary, the precise role of FDG PET in imaging of benign and malignant VCFs has yet to be defined. It may provide the most benefit when CT or MR imaging findings are indeterminate and the exact age of the fracture is known. Advanced imaging plays a crucial role in distinguishing benign from malignant VCFs. The various modalities each have unique attributes. CT provides excellent information about the osseous integrity and fracture margins. PET-CT and SPECT have relatively sparse supporting literature, though with comparable diagnostic results to CT and MR imaging. MR imaging is the established technique of choice, with strong evidence for multiple distinguishing imaging features, which can allow relatively confident characterization of the nature of a VCF. Features strongly predictive of malignancy include expansion of the fractured vertebral body, an epidural and/or paraspinal soft tissue mass, and discrete lesions within the bone, especially if destructive. Features strongly predictive of benignity include lack of these malignant features and at least partial preservation of normal marrow signal, visible fluid- and/or air-filled fracture lines/clefts, and retropulsion of the cortex (Table). The authors acknowledge the assistance of Sonia Watson, PhD, in editing and submission of the manuscript.